Whatever dish you want to cook in a slow cooker — soups or stock, for making chili, pulled pork, etc. — you want a cooker that is reliable, effective, easy to use, consistent, high quality, and inexpensive. There are some real cheap slow cookers out there as well as some high-quality ones. 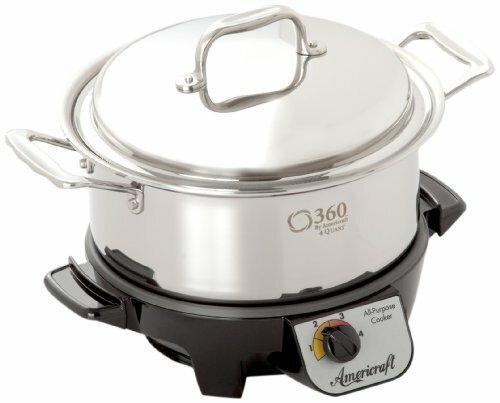 Here is a great Slow Cooker made in USA from 360 Cookware. Let’s have a look at this slow cooker’s features, its pros and cons. By the end of this review, you will have, hopefully, a better idea of what to buy as you search for a slow cooker. This 360 Cookware slow cooker and stock pot is a large cooker and stock pot designed to facilitate making large meals and large amounts of stock to be stored away or used over time. 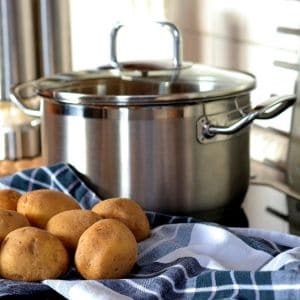 It is a high-quality cooker with more features than many smaller and less expensive pots, and it is useful in a variety of situations and for a variety of applications. 360 Cookware is a great name in stock pots and other kitchen accessories. They make high-quality products that cost a little more than some competitors but make up for it with their overall build and consistency. This crockpot is no exception — it is high quality and quite large, and will serve you for years to come. It is a great investment and makes a great addition to any well-stocked kitchen. Vapor cooking means that this stock pot doesn’t need water or oil to cook. This makes it easy to make soups or chilis that aren’t watered down, and it also means that you can forego the oil in your recipes, which makes the food that much healthier. Vapor cooking is a great and very useful technology. The build of this pot is impressive, to say the least. 110 gauge stainless steel means that it won’t burn, warp, or crack (or corrode) anytime soon. It can take all of the heat and punishment you will throw at it, even if you use it quite often. Unlike most crockpots that simply have 3 discrete settings — low, high, and stay warm — this pot has a continuous control with 4 settings. That means that you can more easily dial in just the right amount of heat for your application. This crockpot is large, at 4 quarts, meaning that it can accommodate cooking large meals and large amounts of stock. It also has a detached pot, which sits on top of the heater. This means that it is even easier than ever to move and pour your food into containers. Though the 360 Cookware Slow Cooker made in USA is more expensive than some of its competitors, but it is every bit worth the money. It is useful for making large amounts of stock and soup, but it can also, because of its design be used for other things. Since the heating base and pot are separate, it is easy to use it in the way you might use a stove top — to brown meat, for instance. It is also possible to use the base to warm other pots and pans — keeping a dish that you have just cooked warm for instance. This crockpot is, overall, a high quality and great addition to any kitchen. It can cook large amounts of stock, soup, chili, pulled pork, or any number of other things, and though it is rather large and also more costly than other units, its build is quite solid and it will last a long time. It seems to provide consistent heat for years of use, and it is dependable enough for you to know that it won’t die on you a few months after you buy it. If you’re looking for a large crockpot, then this is perhaps for you. Who Should Purchase This Slow Cooker? This slow cooker made in USA is a great buy for people who want quality made in America and prefer to buy local products. A good size unit for large families that need to cook up big healthy meals quick and easily without too much effort. It is also a great purchase for anyone who wants to make stock and store it for future use. It is designed to make 4 quarts of stock and then easily remove the detached stainless steel pot to pour the stock into containers. This slow cooker is great for first-time cooks who want to learn to make large meals and feed themselves for days. It allows them to make up to a gallon of soup or chili (or anything else) and store it for later use. In the end, this is not a cheap unit. But is it worth the money? In my opinion, yes it is. The 360 Cookware 4 Quart Slow Cooker is large enough to accommodate all of your needs, and it is extremely high quality. The detached pot is a great feature, and its multiple heat settings are a plus. It is also built like a tank and will be sure to provide you with all that you need from it for years to come.